Lately I have been trying out something new called Thumbtack - it is a website/app where you can send quotes out to people looking for a photographer or other services. I wasn't sure if it would gain me a ton of clients, but I thought it would at least give me some exposure in my new market of Colorado Springs. If you shoot weddings, there are a ton of requests that come through daily for those, so you may want to try it out. The only thing is, you have to pay to send a quote, so depending on the cost of the job, it may not be worth it. I have a profile set-up for different portrait possibilities and received my first client through them last week for headshots! 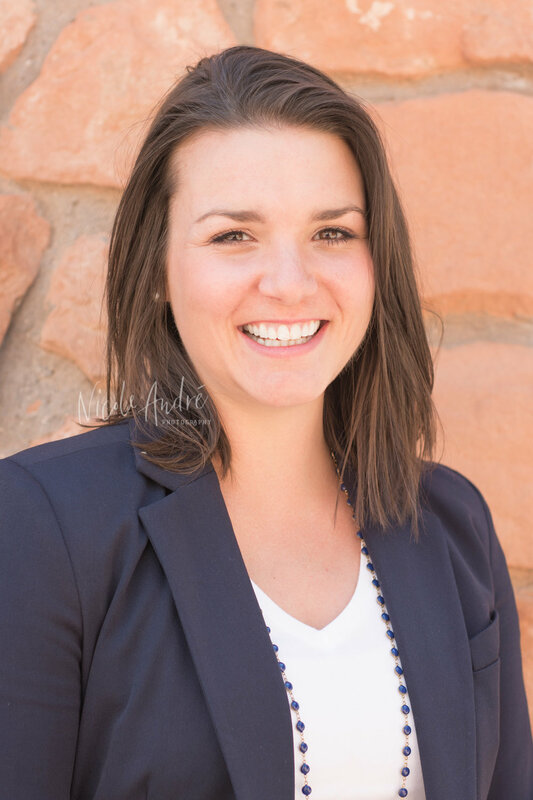 She is new to Colorado Springs and will be using these for her business cards and real estate profile pictures etc. She requested something outdoors (perfect!) and I wanted to show some sort of iconic symbol of Colorado through the portraits. I suggested Red Rocks Open Space outside of Manitou Springs because it has a great outdoor setting, but is never as crowded as Garden of the Gods. Being in front of the camera with a stranger (me, the photographer) can be extremely stressful and uncomfortable, so I like to remove other distractions. Hence, going to a location that is not very crowded; therefore, people will not be watching the entire time. Some of the headshots are below and Carmen was so easy to work with, which always makes my job easier. Thankfully, the weather cooperated that day! They were calling for red flag warnings of wind and even though it was more than breezy at times, we were able to get great shots that look professional. When clients come to me for headshots, they are always worried about posing and say "I don't know what to do." Please do not worry about that, that is what I am there for. I will tell you where to put your hands, how to tilt your head, to smile or not to smile. 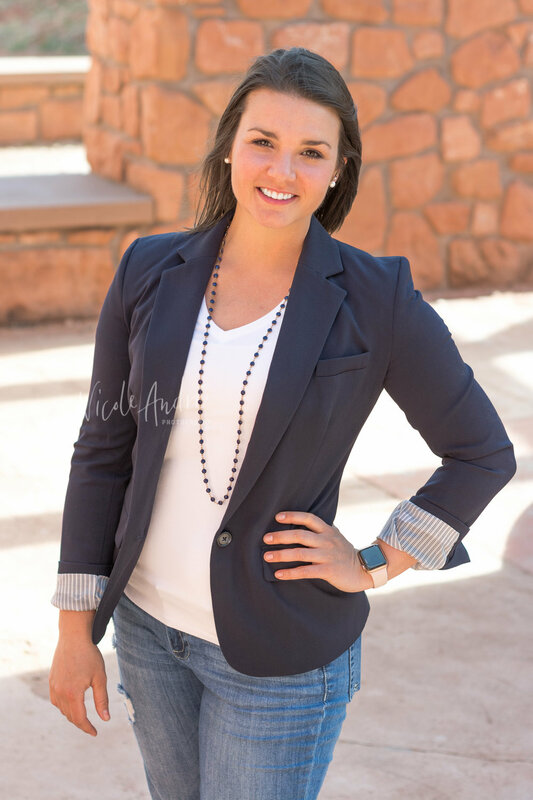 Carmen rocked her headshots at Red Rocks and the results are below. Simple headshot here with a beautiful smile. I asked Carmen to hold a reflector to bounce the light from behind her onto her face. Also, always pay attention to the details in these shots. Where is the jewelry falling? Are there any hairs across their face? Is the collar of their jacket laying properly? It is important to pay attention to these things while posing your client. During headshot sessions, I still like to include some shots for my clients that are standing. It is a nice contrast to a seated position and there are times in your professional career, where a standing pose is better suited. I like to pose women off to one side for a nice "S" curve and then arms crossed, but no thumbs showing. It is powerful, yet feminine at the same time. Always include a little laughter. This would be a great headshot when you want to seem welcoming and approachable. This is a great shot and I stood on a bench to be slightly above her. It can be a more flattering angle on some people, but is also just an easy way to alternate the point of view. Normally I wouldn't have hair blowing in the wind for a professional headshot, but I actually think this one is okay for her. She is young and with the suit jacket and pearls, it is a nice balance so she doesn't seem like she is trying to be too grown up.